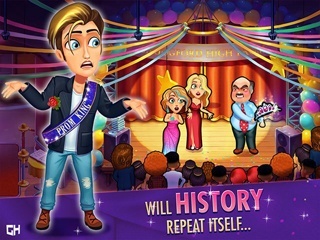 Fabulous - Angela's High School Reunion Platinum Edition Game Review - Download and Play Free Version! Lots of different types of time management levels. Little repetitive after a while. In the latest instalment of the Fabulous series of games, Angela is heading to her High School reunion. The path to such delights isn't so smooth though, meaning she needs plenty of help organizing and attending the event. When things go a little wrong, it's down to you to keep Angela busy and fulfilled through a series of time management levels. Angela probably never expected that organizing her reunion could almost lead her to jail but that's what happens in Fabulous - Angela's High School Reunion. Starting out working in a dress shop, she'll work her way through various scenarios, and even have a brief stay at Snuggford Prison. It'll all be worth it though, providing you keep her on top of things! There's so much to do in Fabulous - Angela's High School Reunion. Rather than just serving customers food or other items like in other Time Management games, you need to make new dresses, create jewellery, stop fights occurring during the reunion, and even perform laundry duty while stuck in jail. You're taking Angela on a constantly varied adventure of different tasks, ensuring you'll always be gripped by the new events unfolding throughout the game. A series of cutscenes tell a gripping story of Angela's journey down memory lane and beyond. It's a thrilling ride. Juggling many tasks and managing your time well is an issue that faces many of us in day to day life. In gaming terms though, it's generally a recipe for a satisfying mixture of busy yet rewarding playing. 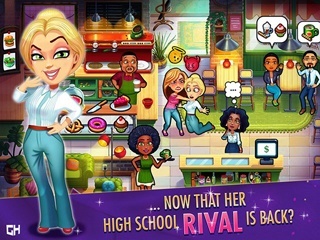 Fabulous - Angela's High School Reunion is a time management game connected to the Delicious Emily series. That means you're guaranteed to have a great time as you focus on helping Angela reach her high school reunion - no matter what. While many other time management games might focus on just one busy form of work, Fabulous - Angela's High School Reunion offers a wealth of variety. There are 90 levels in all, including a series of special challenge levels, and each offers something slightly different. Starting out, you're working in a clothes shop, having to find the right dress for your customer, as well as providing them with accessories such as necklaces and purses. It's a busy place meaning you also have to keep the place tidy, while completing other individual tasks. Simply answering the phone might take up more time than you'd expect meaning you need to keep constantly busy. That's immediately entertaining though, as you're always conscious of what happens next. If this is all that was involved within Fabulous - Angela's High School Reunion, it'd still be pretty fun, but things get much more varied than that. After a while of running the shop, you move onto working in a diner, feeding people tasty meals while prepping them from scratch too. The basic principle of queuing up actions might remain the same, but it's a fun change of direction. Such variety continues as you end up in a flashback to your high school days, helping out at your reunion, and even winding up in jail. Ok, so jail might not sound exciting, but Fabulous - Angela's High School Reunion presents it in a way that still seems quite eventful and fun to work your way out of. No matter the location, there's always something new to do. At its simplest, you're generally completing many specific tasks involving keeping other people happy. Alongside that come challenges such as serving a set number of salads, or answering a phone a significant number of times. Even keeping troublemakers out of the reunion is a potential option here. Further optional extras include spotting a troublesome mouse that likes to lurk around. You can also buy a series of upgrades that boost your efficiency, keeping your customers or clients happy, while giving you a chance to consider things in a more strategic manner. Such variety means you're rarely bored of Fabulous - Angela's High School Reunion. It always offers something new for you to pursue. That's enhanced by the fun storyline. Offered through a series of cut scenes, you'll find yourself watching them rather than skipping them, and seeing what's going to happen next in Angela's life. In each case, even when things don't go well for her, everything feels so charming and colorful. At times, you might feel a little like you're roughly doing the same thing over and over again. After all, each stage of Fabulous - Angela's High School Reunion has you queuing up specific tasks, even if the tasks themselves might change. That will rarely matter though as Fabulous - Angela's High School Reunion is simply great fun. In particular, its challenge levels keep you keen as they change things up, such as reducing how many actions you can queue up at once. Fabulous - Angela's High School Reunion is a great example of the time management genre. Its greatest asset is how it keeps things different at regular points. It always feels like there's something new to do. It's almost as if you're playing multiple different types of time management game given the scenarios change often. You'll love seeing what happens next to Angela, and simply enjoying the ride along the way. This is easily one of the better time management games in recent times.